This post will feature, among other things, a complaint about the United States Postal Service, a high-five for Amazon and my favorite new “Weird Al” Yankovic song. Ready? Let’s go! I preordered the new Weird Al CD a month ago. There are only two musical groups I still buy actual CDs of: Weird Al Yankovic and Metallica. I have them all. Most of them have been purchased on tape, CD and digitally. Anyway, I preordered it from Amazon with guaranteed release day delivery. Today was release day… yep, no CD. This wouldn’t have been an issue if, like Alpocalypse, Amazon “auto rip” was enabled. For those of you who couldn’t ascertain this from context clues, basically, you buy the CD and Amazon gives you free MP3 downloads from the Amazon Music store. I called Amazon when my mail was delivered (sans CD) and they did some checking and told me USPS lost my package. I’m like whiskey-tango-foxtrot. I’m off work today and I wanted to listen to the new album and then subject my family to the 1989 cult classic, UHF. Amazon offered to get another one in the mail, but damn it, I want to listen today! I asked for them to reship my CD and hook me up with an Amazon download so we could listen today. After some hold time, some supervisor conversations and an accidental disconnect, they credited my Amazon Music account the $9.99 so I could purchase it right now – like while I’m talking to supervisor person. I’ve subscribed to Amazon Prime pretty much from the beginning, before they had music or videos. Between the free shipping, Prime Music and Prime Video, I have no problems with the rate increase to $99 a year. I’ve been a Weird Al fan since the late 80s. My wife didn’t care either way before we got together, but now she proclaims she would leave me for Al in a heartbeat. 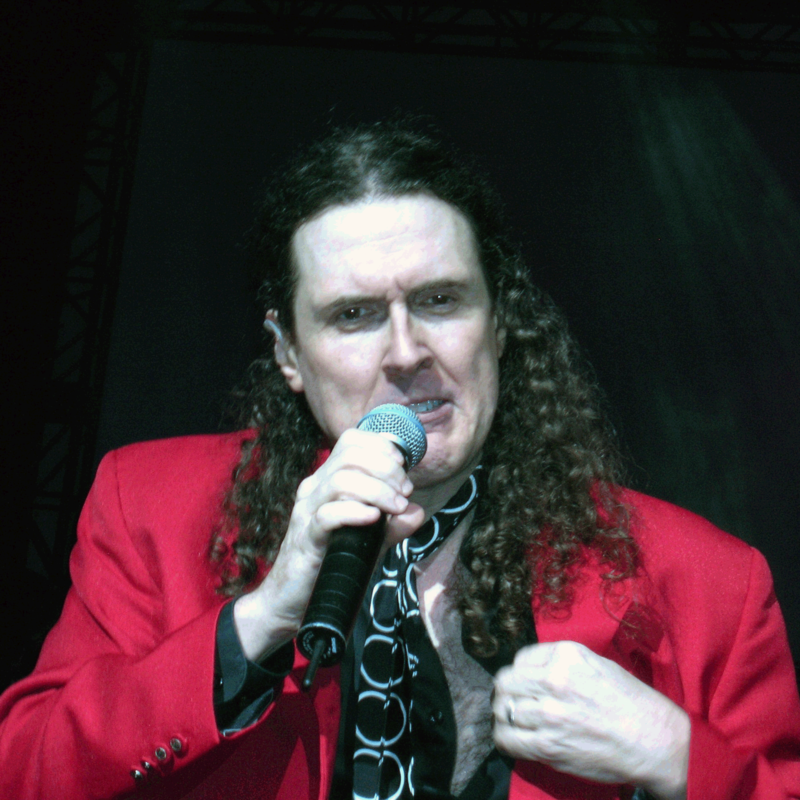 Back in 2009, Weird Al was in town on tour and the tour occurred around our 10th wedding anniversary. We got tickets as soon as they were on sale and got second row center. I had been to a few Weird Al shows in the past, but my wife had never been to a live adult show. It was a lot of fun. The picture of Al at the beginning of this post was from that show. This entry was posted on Tuesday, July 15th, 2014 at 20:28	and tagged with Amazon, Amazon Music, Amazon Prime, Mandatory Fun, Prime Music, Prime Video, USPS, Weird Al Yankovic, Word Crimes and posted in Family, Promos. You can follow any responses to this entry through the RSS 2.0 feed.